Check your exercise ball well for any weakness in the rubber before beginning this ball exercise. It's even better if it's burst resistant. Start by hugging the exercise ball firmly. 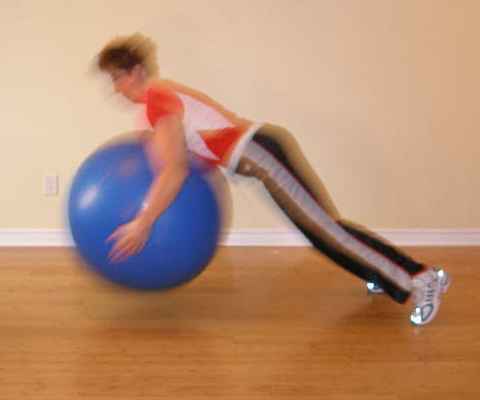 Set your abdominals and hold a neutral position as you have done in all the other exercise ball exercises. If you don't know how, you should definitely not be attempting this exercise. Lower yourself forward and with the spine in neutral position, push into the ball as it hits the floor. At the same time, push with your toes as your body starts to rise into the air. As you land, stabilize your abdominals strongly as you push back up again. Abdominals, hips, quads, calves, pecs, arms. Be very aware of your back postural alignment. If you find your hips sag with each bounce then try bouncing more lightly.